Home > Student Loans > What Happens If You Boycott Your Student Loans? What Happens If You Boycott Your Student Loans? Fifteen former Corinthian Colleges students are angry. The group alleges they were taken advantage of and targeted by the for-profit college system. They’re not the first to complain about the institution, but what makes these students different is that they’re refusing to pay back their federal student loans. They’re called the Corinthian 15 and they’re going on strike. The school, for its part, isn’t backing down. “Corinthian Colleges stands by the education it provided for its students and we are proud of our track record of helping students meet their educational and career goals,” said Joe Hixson, a spokesman for Corinthian Colleges, though he wouldn’t comment specifically on the actions being taken by the Corinthian 15. This isn’t the first time this year that Corinthian Colleges has been under the spotlight. The Consumer Financial Protection Bureau recently sued the company for allegedly engaging in deceptive marketing and predatory lending practices. A company that recently acquired a number of Corinthian’s campuses has already provided $480 million to relieve the private student loan debt of Corinthian students. Hixson did not comment specifically on the CFPB lawsuit. What Actually Happens When You Don’t Pay Your Loans? 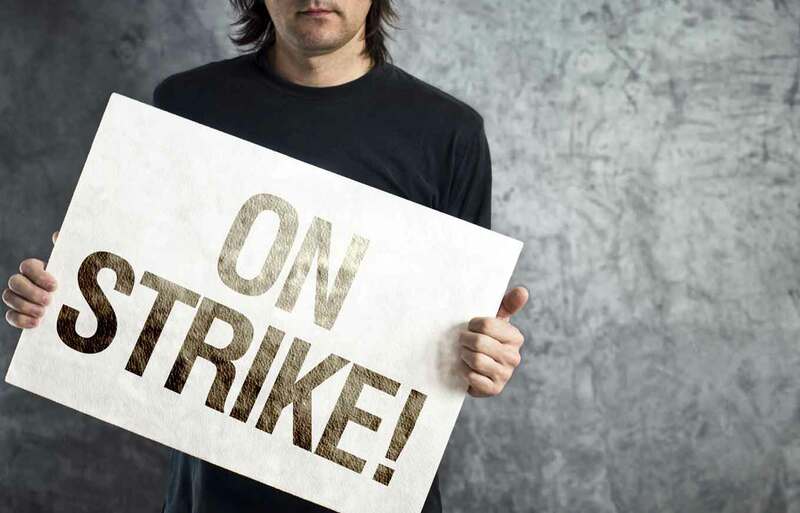 It’s important to consider the ramifications of going on a student loan strike. Before you sign up to join ranks with the Corinthian 15, consider what may very well happen if you default on a federal student loan, either intentionally or otherwise. The government can send a debt collector after you. It can garnish your wages. If you have no wages, the government can (and most likely will) go after you once you start making money. The delinquencies, default and collection activity will do serious damage to your credit, making it difficult to rent a home, set up utilities and secure affordable rates on car insurance. (You can see how your student loans and any other debts are affecting your credit by getting a free credit report summary on Credit.com.) There also may be a variety of fees associated with these different scenarios, as well as interest that will continue to accrue on the loan, making your overall debt load even greater and more difficult to tackle. Furthermore, federal student loan debt is generally not dischargeable in bankruptcy. In short: Boycotting your federal student loans could amount to exchanging one financial hardship for another. The Debt Collective is not oblivious to these consequences. The organizers are personally following up with everyone who fills out a form on its website expressing interest in joining the strike. Ann Larson, one of the Debt Collective organizers, said she starts the conversation with interested borrowers by asking what their loan status is — default, deferment, delinquency, etc. — and goes over the consequences for defaulting on federal student loans. She runs through the list of wage garnishment, losing federal benefits, credit damage and everything else associated with default, and then she asks if the person understands the default rehabilitation process, which is a long, difficult undertaking. She said she has told plenty of people they aren’t a good fit for this effort. “Some people call, they’re excited about it, but you know they are concerned about their credit score and maybe they’re delinquent but not yet in default. … I say at that point, ‘I don’t think you’re a good strike candidate,’” Larson said. Other student loan debt strikes are in the works. There’s a Debt Collective community forum called “Fight Sallie Mae and Navient” (Navient is a spin-off of Sallie Mae and services federal student loans), where a moderator called on borrowers to plan “the next strike.” The Debt Collective is also planning to dispute the Corinthian debts in a lawsuit, Larson said. At the start of March, more than 1,200 borrowers had expressed interest in or support for the Corinthian 15 and their strike, and more than 500 have done the same for the potential Sallie Mae and Navient strike. Larson said they’ll have numbers on actual strike participants in a few weeks. There’s no way to know how much education debt would have to go into default before the Department of Education feels the kind of pressure the Debt Collective aims to create. The national student loan default rate currently stands at 13.7%, representing billions of dollars in defaulted education loans. And what if this doesn’t work? What if borrowers spend months and years in default and never get the leverage they want with the Department of Education? Larson equated it to labor movements, where strikers risk having to walk away, perhaps worse off than when they started. In the student loan scenario, borrowers can choose to start paying again. They will be further in debt than when they started striking, but Larson said they’re making sure people understand this risk before they take it. This issue really pi**es me off! Students swimming in student loan debt have only THEMSELVES to blame. There is no such thing as predatory lending! Everything about your loan was there for you to read and consider. Problem is that everyone just signed their name and held their arms open to receive their money! And….having been too immature and irresponsible to understand the consequences of their choices, they proceeded to borrow the maximum, change majors, transfer to another school, borrow for everything including living expenses, go to school with higher out of state tuition, or private schools, never paid a cent toward the interest that was compounding daily, never worked a day while in school, took 5 years to graduate, bought their books from the bookstore and now four years later you want to go on strike???? Give me a friggin break! I went to a state school, finished a semester early, worked as a tutor, paid interest from day one and have been living at home to triple up on my payments. IBR and deferment were never considered! I know that I borrowed the money and knew I was responsible for paying it back with interest! I have one more year left and I will be paid up in full and looking to buy my first home with my stellar credit rating! I took the time and my very wise parents made me understand what I was about to undertake financially…I look at the poor financial decisions of my friends and now they are paying a hefty price emotionally and financially…all could have been avoided! Welcome to life as a grown up!!!!! Zoe, I would normally agree with you. A debt earned should be a debt paid; however, you are displaying a willful ignorance of the economy. The economy will recover just in time for the skills of millions to become obsolete. Many students graduate from (real four-year) colleges and cannot find gainful employment because of government choices over which they had no control. There is a case there, it is a reality. Now, as far as not choosing the right school, that is on the student. Of course, it is also on the lenders. If lenders know a school is not credible, the lending is predatory. These students should do the same as many others and get on Income-Based Repayment – then they owe nothing until the make more than $40,000. After 25 years, the overage is forgiven. Choosing to not pay on an IBR plan (and owe nothing) is almost as silly as not researching a chosen school. Fixing the economy involves more than blaming, Zoe, and I sincerely hope others are not so radically judgemental. Maybe we should abolish inheritance, then everything is balanced in a generation because elite children would have to give back Daddy’s trust fund and earn their own keep. Maybe we should slow globalization efforts made for the sake of capitalism, then professionals would not have to compete with people who accept $4.50 per day. Maybe we should ramp up free education. I do not know all of the answers, I am not particularly visionary in that area (others are), but I am certain that the solution is not to ‘boohoo’ and name call countless people who (for whatever reason) genuinely feel victimized from a system ruled by banks.